I love fruit. I love it for so many reasons. Picking a piece of fruit off a tree and taking a big bite out of it is awesome. You feel like you can taste the sun in the palm of your hand, there’s nothing else like it. It really is some of mother natures finest work. So I wanted to make sure we had as many fruit (and nut) trees as possible in our yard. But while it takes little work for such a great treat, growing fruit can require a lot of space. And when you don’t have much space here in the city, it can be tough to get multiple varieties. So, we are trying to by wise with the sizes, types and locations of fruit trees. We are focusing on dwarf varieties, which take up a lot less space, can be harvested from the ground and can be very productive for their size. 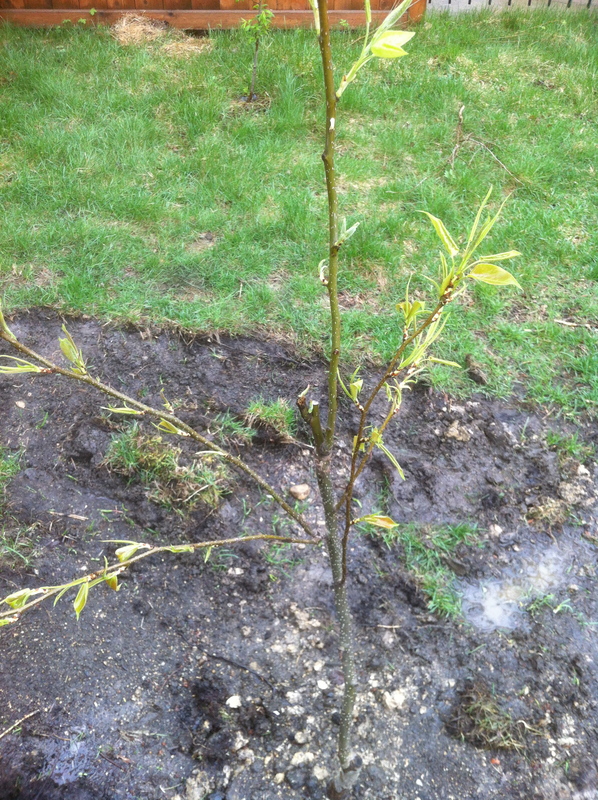 We have 12 dwarf varieties and one full size pear tree so far. We are growing the apples in what is called espalier (via Wikipedia: is the horticultural and ancient agricultural practice of controlling woody plant growth originally for the production of fruit,by pruning and tying branches to a frame so that they grow into a flat plane) along our fence. I hear that more and more farmers are growing this way because it is a very space efficient way to grow apples. 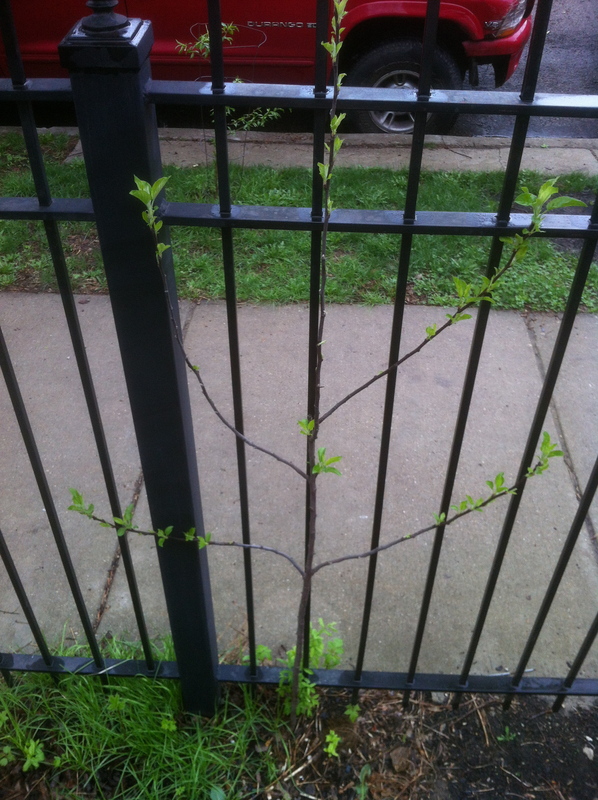 This is my fist attempt at doing it, we hope to have 6 espalier apple trees along the fence of different varieties. I really want people to be able to walk past our home, see a peach or apple or plum or apricot and grab a piece of locally grown fresh fruit. My longer term hope would be to get to between 30 and 40 trees on the property. 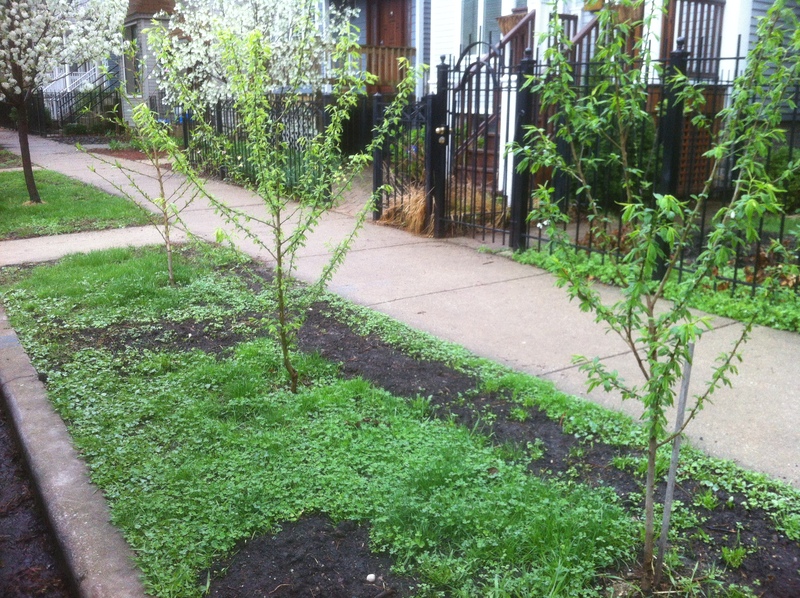 I’d also like to plant some fruit trees throughout the neighborhood so that there is fresh fruit all over the place. You can see from the pictures that our trees are all only about a year to two old. From what I understand it takes between three and four years for them to fruit, so we probably won’t get any fruit this season, but hopefully next. We chose an Asian pear that we grafted a different Asian pear variety on to it for two reasons. One is that it now becomes self pollinating and two because they ripen at different rates with one will ripening earlier in the season and the other ripening a bit later in the season. That way we don’t have to eat all of our pears at once. Its a natural way to do season extension. They take very little effort once they are providing fruit. Prune them once a year and they should be fine. If you mulch properly, you can get a way with very little watering. Only at the extremes where it has been over a week or two without water. They keep giving fruit for 20 or more years, so you don’t have to plant and re plant ever year. They are great for creating micro climates for other plants so you can plant a bunch of other beneficial plants in what is called a guild. They look great and can provide shade to keep it cool around the house. They can act as a wind screen, reducing the amount of wind in an area. I can’t wait to eat some fruit and have enough left over to make preserves or jelly or just can it. So we can have locally grown fruit all year round. Yum. This entry was posted in Food, The Garden. Bookmark the permalink. Cool! Good luck! Very inspiring!